Maintenance-Free Outdoor Solutions is a veteran fence company, supplier and installer. We have been serving the entire metropolitan St. Louis and Metro East areas since 1994. We’re proud members of the American Fence Association and Home Builders Association and have maintained an A+ rating with the BBB since 2001. Our purpose is to satisfy every customer we are privileged to serve with the best fence company in the area. We do this by offering the best in value which includes top quality products, superior installation method, competitive pricing, and excellent customer service. We call it our Maintainance-Free Advantage. We aren’t driven by profits but rather proudly stand behind our products and services, giving the thousands of residential and commercial business owners the peace of mind knowing they have partnered with a company that truly cares about them. We welcome the opportunity to serve you with a new fence for your home or business. We offer free, no-obligation estimates. Let’s get started! We’re proud to have our fence company and showroom out of Arnold MO, the largest city in Jefferson County, Missouri. In Arnold MO, you can experience warm-hearted people, great residential communities, beautiful rolling hills, waterways including the Meremac river and lots of green trees. Fall (autumn) is especially beautiful in Arnold as the leaves change colors. Arnold MO has an abundance of single-family homes, apartments, retirement communities, and business parks alike. Comparable to other cities, Arnold maintenance low taxes, a highly-rated school district and has blossomed over the years in becoming a premier place to live, shop, work, and play. Arnold is a great city for parks as well. With nine city-owned parks, there is over 400-acres of green space and natural preserve areas for boating, fishing, sports, picnicking, and more. Yes, we even have an 18-hole golf club and two dog parks. For more on the City of Arnold, visit the official Arnold MO page here. Read what our customers have said. MFOS did a beautiful job installing our fence. We live on a busy corner in the city and our fence provides us with the privacy we hoped for.I also want to say an extra “thank you” to the company and crew because when we had the 50 plus mile per hour winds a week ago, they came back to inspection it since the concrete was new and not quite set and they did any necessary repairs.We will recommend them to everyone. Tommy and Nick did an excellent job at my home installing the Elite fence. I highly recommend using this company for you fencing needs. Our fence looks great. It was not an easy install, several gates, connect to neighbors fence, deal with city permits, etc. The crew that came was professional and friendly. There is a piece that was damaged ( and hopefully be replaced next time in area). Overall, very pleased with company and fence. The fence looks great. We appreciate the extra effort MFOS did to get it installed sooner and they originally scheduled. Shane and Rory were friendly and worked hard in ugly weather. We are very happy with the company. My wife and I are very pleased with our new aluminum fence. There were several companies to chose from but we decided with Maintenance Free because we felt they were honest and offered the best value overall. Plus - their experienced and their installers were full--time, not third-party. We also appreciated what they call their "maintenance-free advantage program. The salesman Tony, that visited our home was very knowledgeable, and friendly. The estimate he gave us was competitive and thorough.We ran into a hiccup during the install after noticing that the big boulders in our backyard caused a spot where our dogs could stand on the boulders and jump over a section of the fence.We mentioned this to Tony and they resolved the problem, quickly, by ordering a custom-piece that fixed the problem.We could not be more pleased with our fence, the product and support we received from Maintenance-Free Outdoor Solutions.We had a wood fence at our old home. I admit, that was a pain since I had to stain and maintain it year after year. We invested in a maintenance free so we could avoid that hassle, have a better look overall and we believe, increase the overall property value of our home.We highly recommend them to anyone looking for a new fence. From the start we had a great experience. 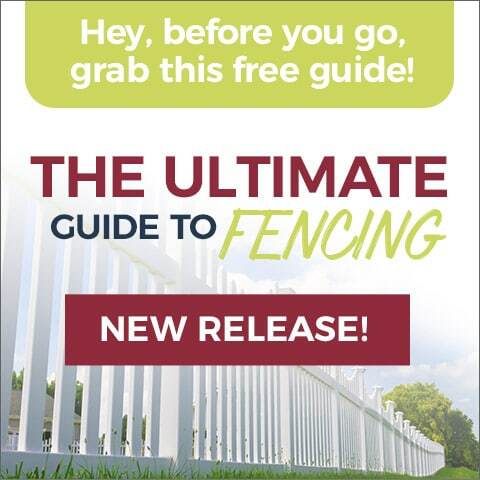 We met with 8 fence install companies and they by far exceeded the rest. The consultant was very informative, the install guys were wonderful & checked in during the day of installation to make sure it was exactly what we wanted. Thank you so much! We love it! Every step of this process was a pleasure, from estimate to installation. One of the owners came to prepare the estimate and he was punctual, polite and thorough in explaining his recommendations for fencing. The installers arrived according to schedule and installed the fence quickly and professionally. I was so happy with our first experience I called the following week to schedule some more work. I highly recommend this company. Extremely happy with the installation of my fence. Beautiful fence and placement of it, professional crew, and they focused on meeting my needs. Would definitely use again and refer them to family and friends. Excellent service! Tony D measured & gave us some great advice. Shane and his crew knocked it out of the park with the install. Very pleased with the Elite fence product. Seriously if you're on the market looking for fencing give these guys a chance.From beginning to end they are professional, courteous, and do high quality work. Had no issues, everything was done as requested and on time and for a great price. I hired MFOS to do a vinyl fence. The project turned out amazing. From start to finish they were nothing short of perfect!!! I got 6 quotes and none of the companies were even close to as professional and extremely CLEAR of exactly what they will be doing and how. They were also priced on the low end of the quotes but I would rather pay more for good work. The workers were gentlemen and definetly deserve 2 thumbs up!!! Hire them and you won’t be disappointed! Mike and Tommy did a great job on our fence! I am so pleased with the results and they worked very quickly. This will change how we get to enjoy our backyard! We purchased an Elite Ornamental Aluminum fence from Maintenance-Free Outdoor Solutions in January 2018 and it was installed in February. I had 3 fence companies come out for estimates. We chose MFOS for a couple of reasons. Tony came out in January to give us an estimate. He spent an hour, or more, going over every detail of the installation. We had a couple of peculiar request and he left us with a drawing showing every detail of the fence. The other two companies were more interested in just giving us the estimate then moving on. We already knew MFOS’s work because our son had used them to install his fence and they had done a fantastic job. Once the weather broke a 2 man crew, Shane & Mike came out to install the fence,. They had the installation completed in two days. You can look down the fence and every horizontal bar is in perfect alignment along the entire fence, including the gates. Once the installation was completed, Mike took a bucket of water and a cloth and walked around the entire fence washing any mud off that was on it. They removed every scrap off the yard and left it as clean as it was prior to starting the installation. Couldn’t be more happy with the entire experience and would recommend MFOS to anyone needing a new fence. Maintenance Free Outdoor Solutions did a great job laying out and installing our aluminum fence. Considering the installation took place on the first week of December just as the temps were turning cold, everything went well with the installation. We are very pleased with our beautiful new fence and our little dog loves her newfound freedom! I had a fence installed recently by Maintenance Free Outdoors and was very impressed with the process start to finish. We first went in and talked to Tim while we were still shopping around. Tim was very knowledgeable on every detail of the fence from the fence itself as well as the install process. We then decided to have them out for a free bid. They came in on the lower end of 5 different bids and while the salesman was there I was very impressed with how detail oriented he was in the measuring and layout process. Once the fence came in stock the install crew was very flexible in working out a time that worked for us to be there during the install. A slight mistake was made by the company in ordering the wrong gate but once they were made aware of the situation they agreed to quickly fix the issue at no cost to me. I was very pleased with how they handled the situation. After they finished the install, one of our dogs twice got halfway through the fence pickets within the first five minutes of being in the yard. We basically now spent a large sum of money on a fence that was proved useless. Tim was contacted and made aware of situation. He helped find a solution and once one was agreed upon, the company agreed to split the cost of making the situation right. They definitely did not have to do that but it was greatly appreciated. You can tell this company cares about their customers. I highly recommend them to anyone even if you pay a little more up front because they are going to make sure you are satisfied from start to finish. Competitive bid. Solid workmanship. Experienced installers. Yard was heavy with rock under grass. Very satisfied. From the estimate to the installation, this was a wonderful experience. They knew I needed the fence for my pup who was jumping my old one and they got me taken care of the day before I left on vacation, making life for my dog sitter much easier. The work was completed in one day as promised and my yard looked beautiful when I got home from work. They not only asked where I wanted any extra dirt, they moved it and filled in a hole where I had a tree taken out. The new fence is absolutely beautiful and my yard looked better than when they started. I highly recommend Maintenance-Free for your fencing needs!! Once you fill out the form a representative will be in touch with you to discuss your specific needs from there. Don’t hesitate to receive your free estimate so you can start living the maintenance-free lifestyle today! © 2019 Maintenance-Free Outdoor Solutions.